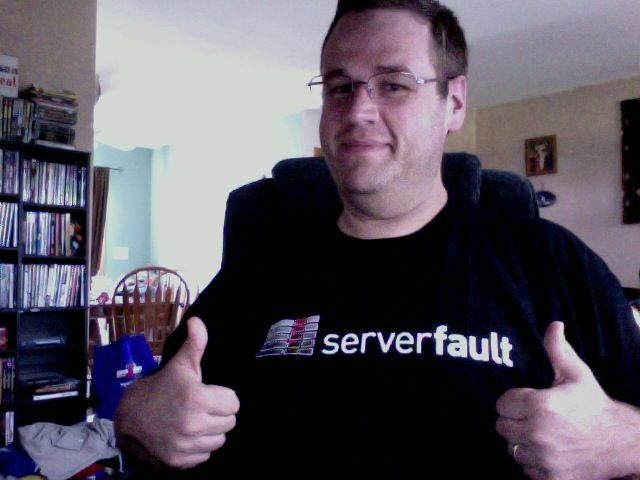 Welcome, ServerFault Valued Associate #0000004! First, we’ve been really, really busy around the offices of Stack Exchange, and we’ve just not had a good amount of time to write blog posts. Luckily, now that we’ve added a new Systems Administrator, Mr. Bart Silverstrim (http://serverfault.com/users/13647/bart-silverstrim) we might have some time for posts more often. All joking aside, we are very pleased that Bart is joining our team; he’s not only a very smart admin (which his serverfault profile will prove), he’s also a great guy to be around. So, WELCOME SERVERFAULT VALUED ASSOCIATE #0000004! May you not crash the blogs with large images. You forgot to apologize for not having Bart pose with a semi-automatic rifle. Oh, and hello Bart. Nice to have you as an overlord. May your reign be malevolent. When Voretaq does damage, it’s in the form of long lasting, multi-generational psychological trauma. I thought the rifle was standard issue during SE orientation? Rumor has it that some of the community was less-than-happy with gun photos. Regularly consuming berries can help reduce your risk of a heart attack by about 32%. Welcome Craig Peterson and Mark Henderson, Server Fault Valued Associates #000000A and #000000B! podcasts are licensed under a Creative Commons Attribution-Noncommercial-Share Alike 3.0 United States License.